2. Whisk together confectioners’ sugar and cornstarch in mixing bowl. Dust mixture over a 12 x 17-in baking sheet using a sifter. Set remaining cornstarch mixture aside. 3. Spread nuts out on another baking sheet and toast in oven for 4 minutes. Turn oven off, but leave nuts inside to stay warm. Place honey in heat-resistant bowl and put inside warm oven. 4. Using an electric mixer, whisk egg whites on medium speed. Add remaining 1 tbsp + 1 tsp sugar to egg whites. Leave mixer running while you complete step 5. 5. Put 1/2 cup plus 2 tbsp corn syrup and 1/2 cup granulated sugar into small saucepan. Put remaining 1/2 cup plus 2 tbsp corn syrup and 3/4 cup sugar into another small saucepan. Stir both saucepans until all sugar is wet. Set both saucepans on high heat. When sugar in first saucepan comes to 250º F (use a candy thermometer), remove pan from heat and add mixture to whipping egg whites. When second saucepan reaches 293º F, pour that sugar mixture into whipping egg whites too. Increase electric mixer speed to high and mix for another 4 minutes. 6. Reduce to low speed, and add the warm honey, salt, warm nuts, and currants. Mix until evenly distributed. 7. Scrape nougat into prepared baking sheet. Sift cornstarch mixture over entire nougat surface. 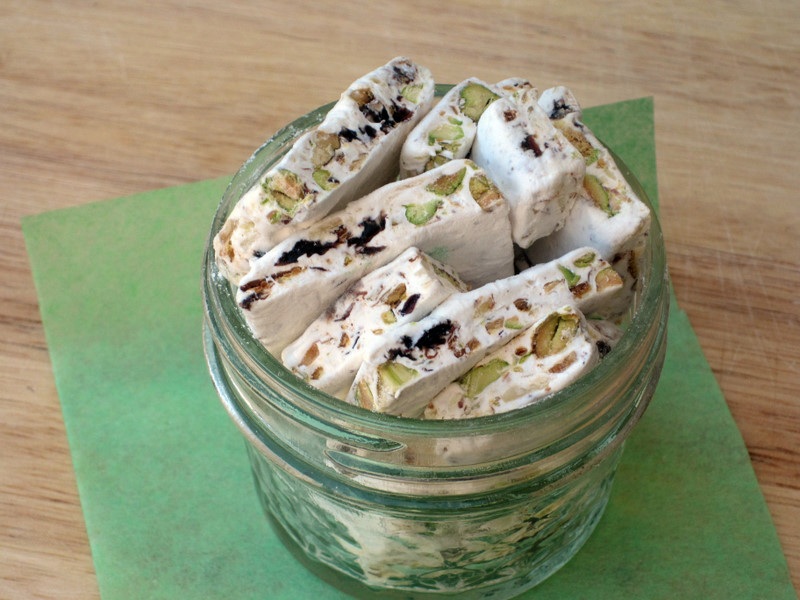 Using a rolling pin, roll nougat until 3/4 inch thick. Set on wire rack to cool for 30 minutes. 8. 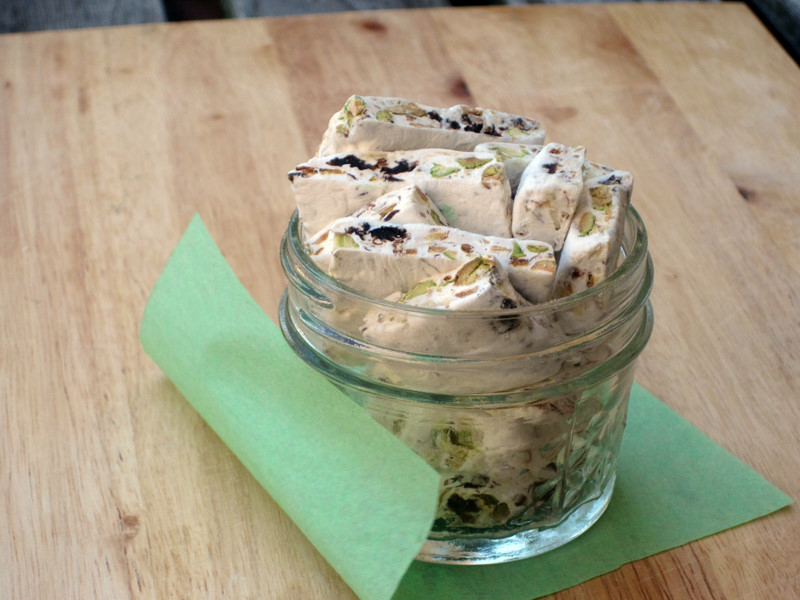 Place cooled nougat on cutting board. 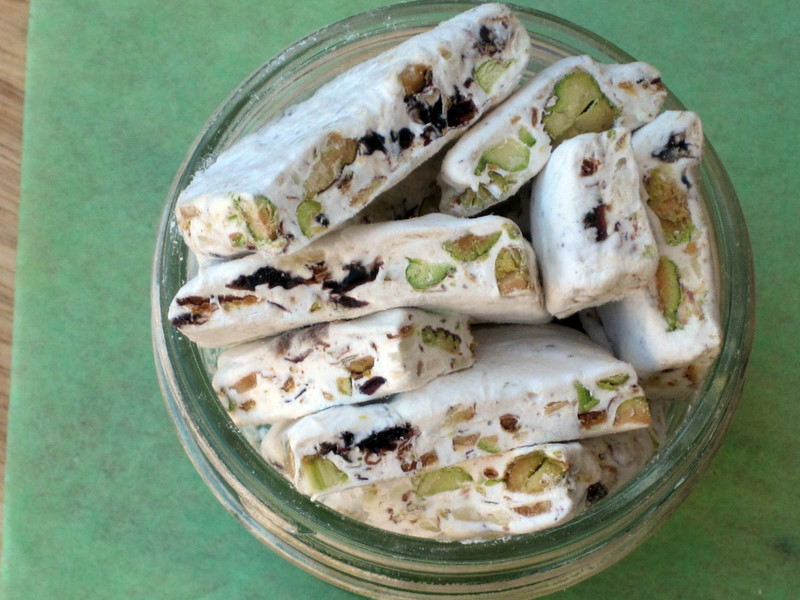 Use a knife coated in non-stick cooking spray to slice nougat. Delicious recipe and very blant photos.Please work on your photos !